For about five seconds during Monday night’s Warriors-Lakers game, Steph Curry looked closer to someone that’s never played basketball than a two-time NBA MVP. Things started out well in the sequence for Curry; he stole a pass from the Lakers’ Kyle Kuzma and had a wide-open fastbreak. 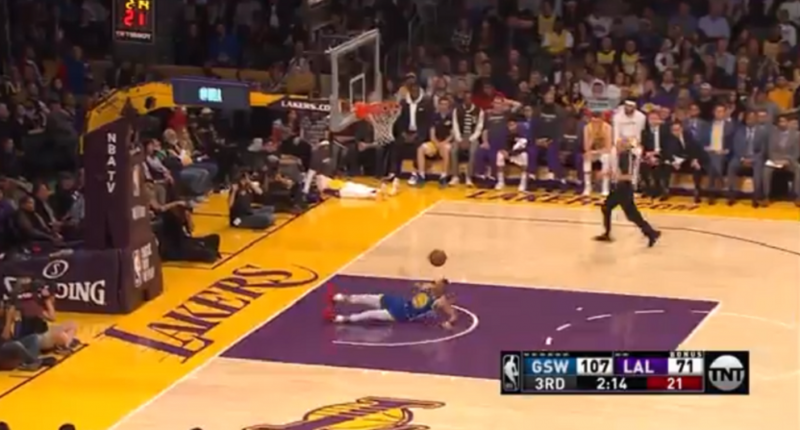 But when Curry tried to go up for a layup or dunk, he looked like he slipped on ice, and fell on his back. Andre Iguodala ran the ball down and gave Curry a chance to make up for the embarrassing play with a corner three… and Curry shot an airball. That summarized how things went on the shooting front for Curry; he went 3-of-12 from the field and had only 11 points. But he did dish out 12 assists, and had a +/- of +27 in a 130-111 Warriors win.